Hair: Claudia wears her hair very long, down almost to her knees. It?s a honey brown that she has pulled back and plaited into several braids every morning. Eyes: Her eyes are liquid blue and slightly to large for her face but they catch and hold the light well. Voice: Claudia?s voice is soft and sweet, giving the impression that she is kindhearted. Overall Appearance: Overall, Claudia is a small-boned girl with sharp features. Her nose is small and hawkish which provides a sharp contrast to her large eyes. She?s average height for a noblewoman, but her tiny frame often makes her appear shorter than she is. Her most prominent feature is her hair, which is always elaborately designed. Unless she is out in the mists in her capacity as a Mistborn Claudia is always immaculately dressed and at the forefront of Luthadel?s fashions. She has a gentle, graceful manner that generally puts people at ease and makes her appear more approachable than she might otherwise be. Claudia tends to give small, subdued smiles and rarely appears angry or upset. Strengths: Claudia?s greatest strength is her ability to see things from multiple sides. She can gather information and facts easily. She?s a skilled researcher. She?s also talented at keeping her opinions to herself. She doesn?t often share something with someone unless she really wants them to know about it. Weaknesses: She had be indecisive and for now she?s just going with the flow of her house. A perfectionist, Claudia is never satisfied with herself, or what the Final Empire has to offer. She?s also highly secretive, sharing as little as possible with the people she meets. Claudia is strange as nobles go. She is skilled at pretending to think and act like every other noblewoman but it?s a front for her real opinions. She sees the Final Empire as a place filled with sorrow and decay. It seems to her that even most of the nobles ? the privileged class ? is unhappy. She has no idea, however, what to do about it. Her opinions about the Final Empire have made her distant and unreachable with anyone who has tried to befriend her or court her, so she has no real close friends and no serious suitors. Claudia does act as a Mistborn, spying and other things for them but so far it hasn?t helped her sort out her feelings. She?s undecided about the skaa as well. Sometimes she sees them do beautiful work, like some of the craftsmen of Luthadel and she thinks they must have intelligence. At other times she sees the skaa in the streets; she sees the dull look in their eyes and she believes they are little more than animals. 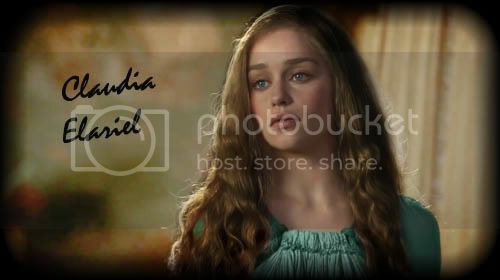 Claudia was born the youngest of two children to Alistair and Helena Elariel. Her older brother, Mikhail was two years her senior. Her early life was typical for a noblewoman. She was raised in Luthadel surrounded by the heart of politics in the Final Empire. When she was little she didn?t understand the social differences between skaa and nobles, so she constantly got into trouble for trying to befriend the children of her families? maids and servants. When she was eight Liana, the youngest child of Claudia?s personal attendant was caught in Claudia?s room playing with her things. She had given the girl permission but that hadn?t mattered to Claudia?s parents. The girl was beaten severely for the infraction and her parents were sent away. Claudia never saw them again, and she never tried to befriend another skaa. After that Claudia was often alone. It was during this time that she began to think there was something wrong with the Final Empire. When her brother reached the age of ten he was taken and beaten in the common noble custom. He Snapped as a Pewterarm. The beating had a lasting effect on Claudia, who despised the practice and would never forget Mikhail?s face as he was carried back into the house, pale and nearly lifeless. Mikhail recovered and became intensely involved in his training after that and Claudia became more and more withdrawn. Concerned, Lady Helena engaged tutors and other noble children to try and draw her daughter back out. While she took to the education and she was willing enough to play with other children Claudia never really let herself grow close to anyone. Her own customary beating had far less impact. In fact, Claudia had failed to Snap and suffered through her injuries and memory loss for the week surrounding the time of the beating. It seemed then that she was destined to live out the average life of parties and eventually marriage, although privately Claudia had promised herself that she would never have children. She continued her education, learning both reading, writing and the courtly arts. At sixteen she made her debut at the Luthadel balls and was immediately one of the most eligible women there. However, Claudia?s distant reticence put off most suitors. When she was seventeen an assassin attempted to kill Mikhail. The attack was poorly planned, executed by an angry skaa from one of Elariel?s plantations who had somehow gained the ability of a Coinshot. Claudia was caught up in the attack, accidentally stepping between her brother and the assassin at the precise moment he had launched his coins out on their killing path. She was badly injured and might have died except for one thing: as soon as the coins hit her, Claudia Snapped burning both Pewter and Tin, proving that she was a Mistborn. Mikhail dragged her away from the scene and her Snap was kept secret by the Elariel family. Naturally Lord and Lady Elariel were thrilled to have a Mistborn among their children. As soon as Claudia recovered her training began. She did not take to it well, applying herself only half heartedly to the task. Although she loved the feeling she gained burning pewter and tin she didn?t like the idea of participating in what she saw as the sickness of the Final Empire more directly which she knew as a Mistborn she would be required to do. Over the course of the next few years she would develop some facility with all the metals but she never really came to see her status as Mistborn as freedom the way most did. To Claudia it was a chain, binding her more firmly to the established order of things. Finally, although certain that she could do better if she would only apply herself, her teacher pronounced her ready to take up active Mistborn duties. Now, albeit reluctantly, Claudia goes out into the Mists, spying and collecting information for her family. She performs all of her duties, although with lackluster effort. And every day she thinks about the sickness and decay that makes up the Final Empire. Claudia stood on the balcony overlooking the garden. Below her skaa worked steadily watering the plants and clearing the ash. In the distance the red sun colored everything a sickly hue as it sunk behind the horizon. In the courtyard her brother Mikhail was sparring with one of the captains of the guard. They spun in a dizzy circle, exchanging blows staff to staff so fast that her eyes could hardly track their movements. On impulse she turned and hurried down the stairs and out into the evening air. Mikhail was not the better fighter. He was a still a young man, only half-trained and the captain periodically scored a hit not just on his quarterstaff but hitting his body as well. Claudia could see several bruises forming on his arms and back. One was a lurid blue and purple right next to the small scar he had carried since the day he had been beaten in an attempt to bring about an Allomantic Snap. She remembered that day well; better than she remembered her own, in fact. They had carried Mikhail in unconscious and bleeding from cuts all across his body. He had told her later that the beating had gone further than it should have, and if he hadn?t started burning pewter he might have died. Claudia had always thought she remembered that day more clearly than the day she had been taken out and beaten within an inch of her life because he had Snapped. She had nothing to show for it except a week of lost memories and a vague feeling that something was wrong in the world. There was a sudden zipping sound. Claudia felt a sharp, piercing pain in her upper arm. A shrill cry of surprise rose over the thwack of wood striking wood. It took her a second to realize that she had made the sound. Before she had a chance to move three more coins slammed into her, one clipping her outer leg and the other two catching her strongly in the side. She gasped as agony filled her body. Distantly she was aware of Mikhail yelling, ?Claudia!? She was vaguely aware of strong hands grabbing her as she fell, but to Claudia it seemed unimportant. She felt a flush of warmth deep within, pulsing, demanding her attention. She felt the warmth as an all encompassing presence and without thinking about what it might mean, Claudia drew deeply on its strength. At once she felt her muscles strengthen. The dizzy, desperate feeling faded. She groaned slightly her hand clamping over her wounded side. At the same moment the strong smell of blood assaulted her. She could feel the soft silk of her dress and the jagged edges of the metal bits that had lodged in her side. ?Let me up,? she said raggedly. She could hear three, no?five men across the courtyard fighting. ?You?re badly hurt,? Mikhail said to her. She winced; his whispered was like a roar in her ears. She pushed away from him. The force of her push was strong, and she saw the surprise register on her brother?s face. The only thing that kept him in place was his own Pewter-burn. He stood, still holding her and started to pull her into the house. ?Let me go, Mikhail,? she said, her voice half-panicked. The clamor nearby was winding down, she wanted to see what was happening. She reached again for the warmth in her chest, flaring its power. Her muscles burned with life like they never had before and this time when she pushed against her brother his grip broke and he stumbled slightly. She half fell but was able to get her feet under her in time to catch herself. She coughed again at the thick coppery smell. Bright light stabbed at her and she blinked quickly to clear her vision. Across the courtyard three men were standing over the body of an armored man. The fallen figure was wearing armor and livery that matched the other Elariel guards. Coins were scattered across the cobblestones. There was blood everywhere. She heard Mikhail moving behind her, and she took a sharp breath as he grabbed her arm suddenly pulling her into the house. Interesting. Like House Elariel, in a side with two conflicts, she could go either way. I don't know if that's intentional, but I like it.